A while back (around mid-year), Mecca Maxima started stocking the Urban Decay Vice lipstick and liner range. It features 100 colours in a range of finishes and are $28 each – a great price for top notch lipsticks. Now, for Christmas, Urban Decay have come out with lipstick palettes featuring 12 shades of the Vice range. Urban Decay released 2 – Blackmail (available from Mecca and the one I have today) and Junkie (available from Sephora US). Drum roll please. 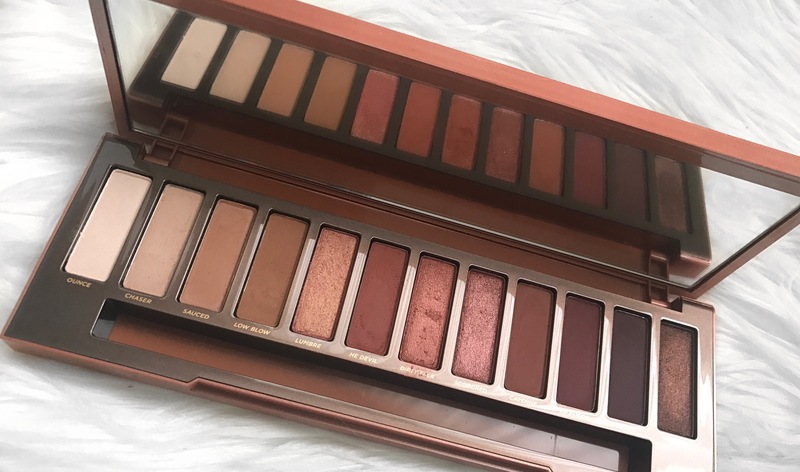 Ladies and gentlehomies I present to you, the Urban Decay Ultimate Basics Naked palette! I picked this up during the Mecca Beauty Loop Level 3 Holiday pre-release but it will be available from Mecca on November 8th to everyone. If you like makeup even just a little you would know what a Naked palette is. There are currently 3 Naked palettes: 1,2,3 and smoky and Naked Basics 1 and 2 and now there is this 12 pan palette of perfection (in theory). Just thought I’d do a little unboxing of the Mecca L3 box. Mecca is an Australian version of Sephora (even though we actually have Sephora…). Basically there are 3 levels – 1,2,3 (wow, really Meneka? You don’t say). The more you spend, the higher the level. Every period, they give out a box of samples based on your level. So today I’ll be giving you my honest opinion on the highly sought after Too Faced Sweet Peach palette which may or may not make you feel better if you missed out! Guess what iiiiii have! The gorgeous limited edition Urban Decay Alice Through the Looking Glass Palette! I purchased this baby off Mecca (Aussie Sephora – even though we have Sephora) last Tuesday at 12:01 am, when it came out, but there was a weird issue with shipping and it arrived a week later…. Oh well, IT’S IN MY HANDS NOW! I’ll be showing you guys some swatches and my thoughts on the colours and some dupes/similar shades!